Gnarboots are a band, and an experience, and a way of life. Primarily Aaron Carnes and Adam Davis, the live band sometimes includes members of Cartoon Violence, Continuum Kingdom, and other random bands. 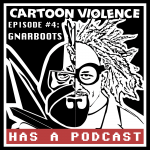 Gnarboots sits down for episode 4 of Cartoon Violence Has A Podcast and lets the stories flow. We also share our top 5 sandwiches and experimental bands, and play some games from Aaron and Adam’s old podcasts.